Wells Fargo Claws Back $75 Million More From 2 Executives Over Fake Accounts : The Two-Way Former CEO John Stumpf "was too slow" to realize the risk of sales practices, the bank's board says. The scandal also brought a $185 million punishment from the Consumer Financial Protection Bureau. John Stumpf, the former chairman and CEO of Wells Fargo, will repay $28 million to the bank over an improper sales practices scandal. He's seen here visiting the House Financial Services Committee last September. Some 5,300 Wells Fargo employees lost their jobs over the fake-accounts scandal — a number far higher than the bank's board says it was initially led to believe. 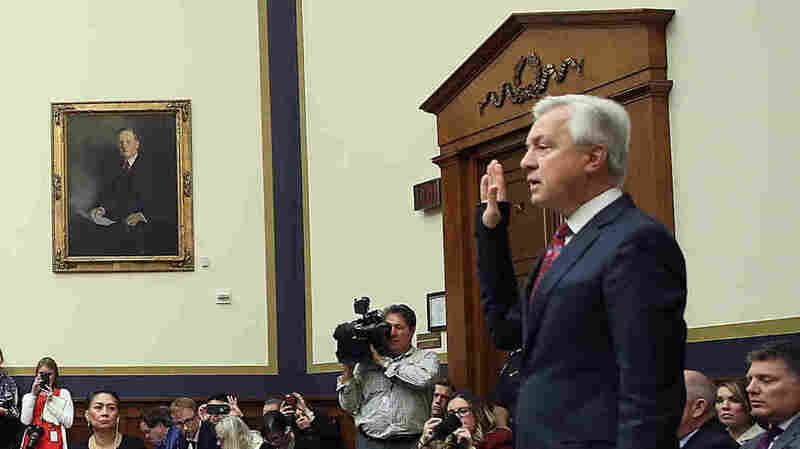 The report says Stumpf "did not appreciate the scope and severity of the problem" and that he "continued to publicly support the appropriateness of Wells Fargo's sales goals and to highlight that the vast majority of Wells Fargo employees 'got it right.' "
Former Wells Fargo employees who tried to raise red flags about the sales practices have told NPR's Chris Arnold that they were fired or pushed to resign — and an investigation showed that the bank had put black marks against those employees' names in a permanent national database used by banks and regulators. Tolstedt's current perspective isn't represented in the report — its authors say she "declined, on advice of counsel, to be interviewed as part of this investigation."